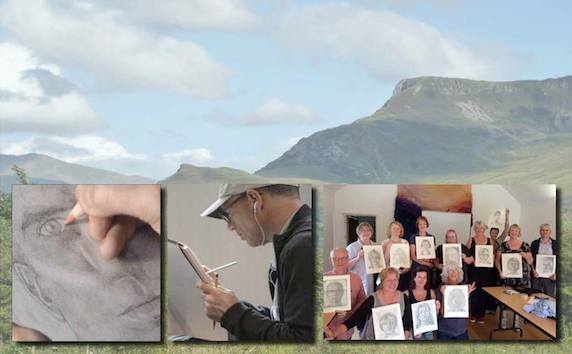 Curious about what happens inside a 5-day Drawing in teh Right Side of the Brain® workshop? Here is a peek inside the last couple of days of a recent workshop held in London. "I'd recommend this course to anyone who's interested in drawing and arts or just simply wants to have fun and see the world in a new light ” Palma B. Every drawing goes through what I like to call an ugly duckling stage – we might have some marks on the paper but maybe they are not quite in the right position and it doesn’t look how we expect it to. At this stage it is common that people get frustrated and give up. However, if you plough on chances are that your drawing will develop in a way that may surprise you. Even if it’s not the drawing you imagined I am certain you will have learned something at the end of it and very often it has qualities that you might not have anticipated. More importantly perhaps you would have broken through a barrier and will be starting to cultivate a willingness to just keep going. It is so important not to give up but instead work through difficulties. This is an important skill not just for drawing but for life. Remember, it’s not that you can’t do it but rather you haven’t yet worked out how to do it. Don’t give up early on in the drawing. Keep going regardless; setting aside expectations of the final outcome. Drawing is about adjustment. Don't expect to put a line down and for it to be right. Drawing is an exploration – the more we look the more we see. The more we see the more accurate are our marks. Expect to make adjustments to your drawing all the time. Keep working on all areas of your drawing - it’s easy to get sucked into one particular area and lavish a huge amount of attention on it. It may look great but you will then be loathe to make changes if you discover that perhaps it's not quite in the right place. Don’t be afraid to make quite radical changes late in the drawing. You can move a feature more easily than you think and it is always worth doing! To make a radical adjustment don’t erase out the ‘wrong’ bit. Decide where you want the new position to be and then, assuming that key areas are accurately observed, copy what you have already drawn in the new position. As you draw you can incorporate bits of the old drawing in the new – only erase out any unnecessary bits once the transfer is complete. If you erase it all at the start you have no reference to follow and you are literally, starting again.